According to the North Carolina State Board of Elections, voter registration statistics as of Nov. 3, 2012, show that 113,000 Latinos are registered to vote statewide. Overall, Latinos make up 1.7% of the state’s 6.6 million registered voters. The majority of voters in North Carolina are white—there are 4.7 million white registered voters, representing 71.2% of all registered voters in North Carolina. Additionally, about two-in-ten registered voters in North Carolina are black (22.4%), with about 1.5 million voters statewide. The state does not report detailed information on Asian registered voters. The number of Latinos registered to vote has increased tenfold since 2004. It rose from 10,000 during the 2004 presidential election to 68,000 during the 2008 presidential election and now stands at 113,000. The share of Latino registered voters in North Carolina has also risen since 2004, from 0.2% in 2004 to 1.7% today. In 2004, whites made up more than three-quarters of all registered voters in North Carolina (77.8%). That share has been dropping, and whites now make up about seven-in-ten of all registered voters in North Carolina (71.2%). The Hispanic population in North Carolina is the 11th largest in the nation.4 About 805,000 Hispanics reside in North Carolina, 1.6% of all Hispanics in the United States. North Carolina’s population is 8% Hispanic, the 25th ranked Hispanic population share nationally. There are 196,000 Hispanic eligible voters in North Carolina—the 18th largest Hispanic eligible voter population nationally. California ranks first with 5.9 million. 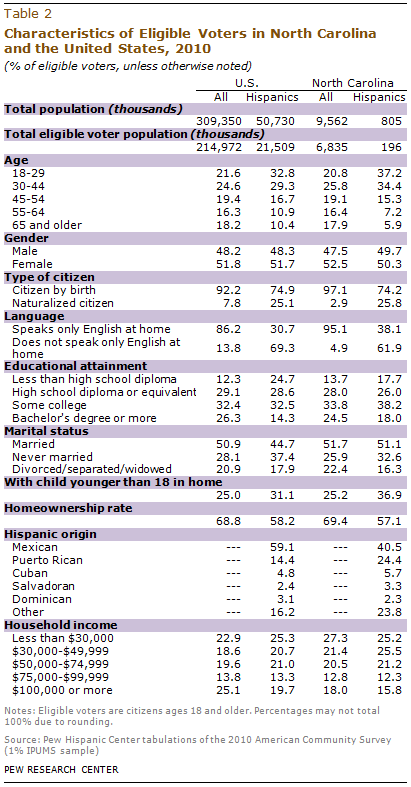 Some 3% of North Carolina eligible voters are Hispanic, the 32nd ranked Hispanic eligible voter share nationally. New Mexico ranks first with 39%. Less than one-fourth (24%) of Hispanics in North Carolina are eligible to vote, ranking 47th nationwide in the share of the Hispanic population that is eligible to vote. By contrast, nearly eight-in-ten (79%) of the state’s white population is eligible to vote. Age. Some 37% of North Carolina Hispanic eligible voters are ages 18 to 29, above share of all Latino eligible voters nationwide (33%) in that age range. 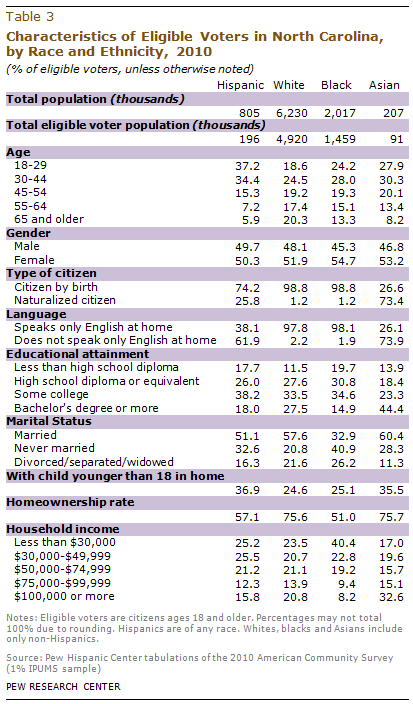 By contrast, only 21% of all North Carolina eligible voters and 22% of all U.S. eligible voters are ages 18 to 29. Citizenship and Nativity. About one-quarter of Hispanic eligible voters in North Carolina (26%) are naturalized U.S. citizens, compared with 25% of Hispanic eligible voters nationwide. This rate is much higher than that of all eligible voters in the state (3%) and in the U.S. (8%). Hispanic Origin. 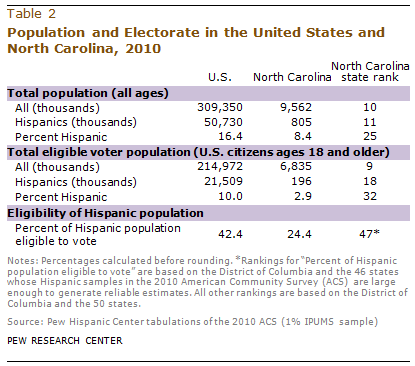 Like Hispanic eligible voters nationwide, the plurality of North Carolina Hispanic voters are Mexican. Fully 41% are of Mexican origin, another one-fourth (24%) are of Puerto Rican origin, and 35% claim some other Hispanic origin. Among all U.S. Hispanic eligible voters, about three-fifths are Mexican (59%), while 14% are Puerto Rican and 26% claim some other Hispanic origin. Educational Attainment. About two-in-ten (18%) Latino eligible voters in North Carolina have not completed high school. This is greater than the 14% rate for all eligible voters in North Carolina, but less than the rate for all U.S. Hispanic eligible voters (25%). Homeownership. More than half of Hispanic eligible voters in North Carolina (57%) live in owner-occupied homes, just below the share of all Hispanic eligible voters nationwide (58%). Greater shares of all eligible voters in North Carolina and all eligible voters nationwide (69% each) live in owner-occupied homes. Number of Eligible Voters. White eligible voters outnumber Hispanic eligible voters in North Carolina by 25 to 1. In addition, black eligible voters outnumber Hispanic eligible voters by more than 7 to 1, while there are twice as many Hispanics as Asians among eligible voters (196,000 to 91,000). Age. 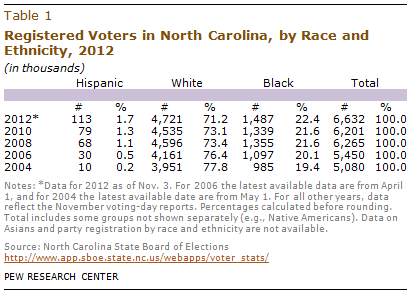 Latino eligible voters are younger than Asian, black and white eligible voters in North Carolina. Some 37% of Latinos are ages 18 to 29, compared with 28% of Asian eligible voters, 24% of black eligible voters and 19% of white eligible voters. Educational Attainment. Hispanic eligible voters have lower levels of education than do white and Asian eligible voters, but higher levels of education than black eligible voters in North Carolina. Some 18% of Hispanic eligible voters have not obtained a high school diploma, compared with 20% of black eligible voters, 14% of Asian eligible voters and 11% of white eligible voters. Homeownership. Hispanic eligible voters (57%) are slightly more likely to live in owner-occupied homes than black (51%) eligible voters in North Carolina, but they are less likely to do so than white or Asian eligible voters in North Carolina (both 76%).